2014 FEASt Call for works! The 4th annual FEASt Festival is seeking works for fixed media, live-electronics, laptop ensemble, and performer(s) with fixed media. Works with a video component will also be considered provided that the video component is clearly documented and can be projected with our equipment. The FLEA (FIU Laptop and Electro-Acoustic) ensemble will be in residence to perform accepted works for laptop ensemble. Submissions must arrive by October 7, 2014. Pieces for up to eight channels will be considered. Preference will be given to works under 10 minutes in duration. Selected composers are responsible for providing performers and are expected to attend the concert. Submissions selected for the concerts will also be considered for inclusion on the upcoming 2014 FEASt Festival digitally released album. FEASt is also accepting installations. If you would like to submit an installation, please include a thorough explanation (including images and sound files) and complete the same process required for other works. Submissions must arrive by October 7, 2013. The 3rd annual FEASt Festival is seeking works for fixed media, live-electronics, laptop ensemble, and performer(s) with fixed media. Works with a video component will also be considered provided that the video component is clearly documented and can be projected with our equipment. 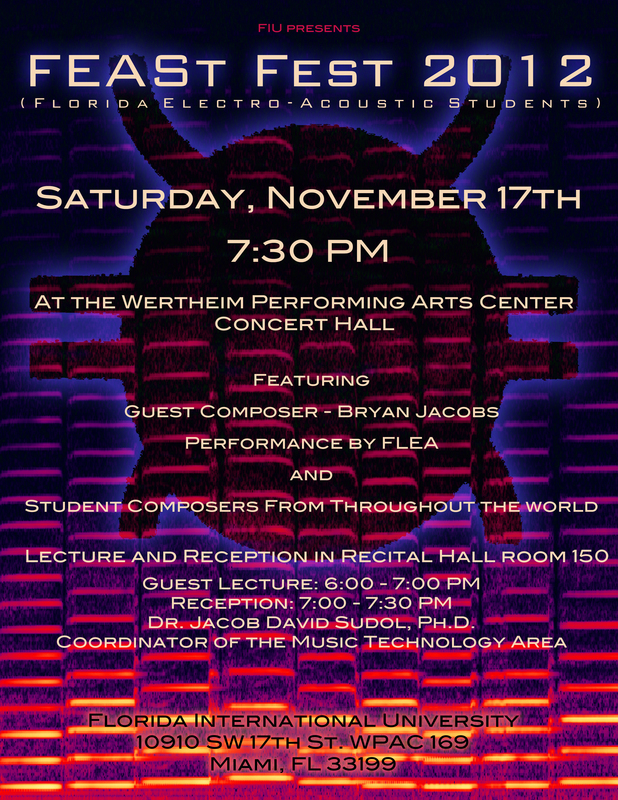 The FLEA (FIU Laptop and Electro-Acoustic) ensemble will be in residence. Pieces for up to eight channels will be considered. Preference will be given to works under 10 minutes in duration. Selected composers are responsible for providing performers and are expected to attend the concert. Submissions selected for the concerts will also be considered for inclusion on the upcoming 2013 FEASt Festival digitally released album. FEASt is also accepting installations. If you would like to submit an installation, please include a thorough explanation (including images and sound files) and complete the same process required for other works. To submit work electronically, please e-mail an mp3 or a link to the file with the above information in the body of the e-mail to feastfest@gmail.com. FEASt is back! This will be the first time that FEASt becomes an annual event, and everyone in EARS is very excited. This year’s FEASt-ivities will comprise of a one-day lecture/concert featuring electro-acoustic composer Bryan Jacobs. The lecture will take place in the FIU School of Music Recital Hall, starting at 6 PM. Mr. Jacobs will speak about his body of work and musical aesthetics in the world of electro-acoustic music. After the lecture, there will be a short reception in the same room. The main event will take place in the FIU School of Music Concert Hall. We will have a special performance by the FLEA (Florida Laptop and Electronic Arts) ensemble, along with fixed media, video, and live electronics pieces by student composers from around the world. This event is open to the public, so we hope to see you all there! Below you can find the flyer for this event. Tell your friends! Welcome to EARScast: The official website of EARS and FEASt fest!